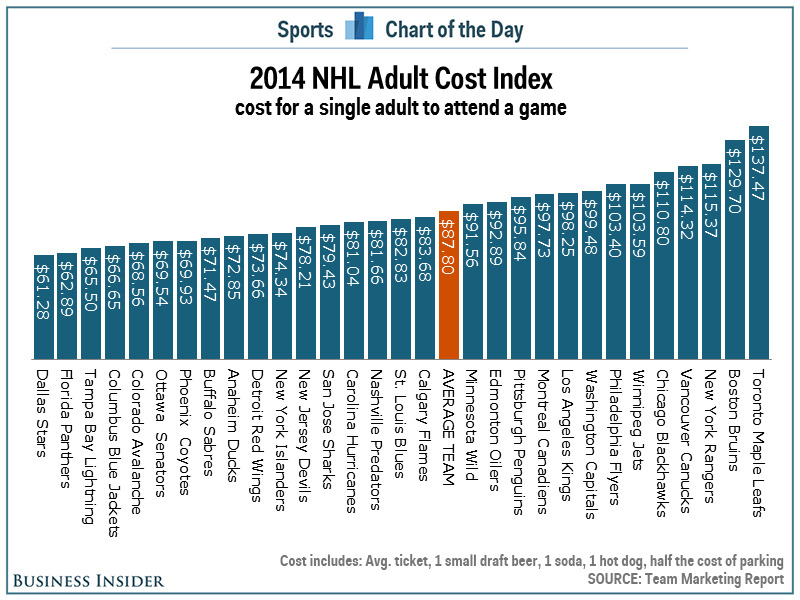 If a fan wants to go see the Toronto Maple Leafs in person this season it will cost them US$137.47 on average according to the Adult Cost Index (ACI). The Maple Leafs are still the most expensive team in the NHL. However, the cost of seeing them live is actually down from US$151.41 last season as their average ticket price has fallen from $US124.69 to $US113.66 as well as slightly cheaper parking. The ACI is calculated using data collected by Team Marketing Report from surveys of teams. 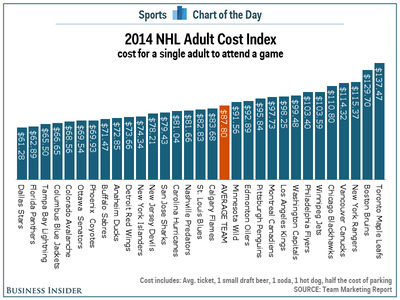 Similar to Team Marketing’s Fan Cost Index (FCI), which looks at the cost of attending a game for a family of four, the ACI is the cost for a single fan to purchase an average-priced ticket, one beer, one soft drink, one hot dog, and half the cost of parking at the stadium. The biggest difference between the FCI and ACI is that we have removed the extraneous costs (e.g. caps, programs) and assume the fan shares the cost of parking with one other person. The average ACI in the NHL this season is $US87.80, up 4.5% from last season ($US84.05). Of the 30 teams in the NHL, seven have an ACI of at least $US100.00.